As I said when the Chase field was set, beginning this week when a Chase driver takes victory, it automatically moves them into the next round. What makes this week more impressive is not only how that win came, but the story leading into it. Earlier this week, Denny Hamlin tore his ACL playing basketball, his second injury playing the sport while not in the car. However, in a very gutsy call, he decided to hold off on surgery until after the season ends. He’s still going after a championship, and missing a race is not an option, and even having a relief driver is not much of an option. This championship means too much to anyone to not make the full distance. So, with an injury already in his head, Hamlin came to Chicagoland still feeling he was ready to go. On lap 3, that took a bit of a hit as his car went for a spin through the third corner. But, the team never got rattled, because it was only the third lap. There were still 264 laps remaining, an eternity to make up the lost positions, and something this team was more than capable of doing. When it mattered the most on the final caution, this team and this driver lived up to their Chase expectations. 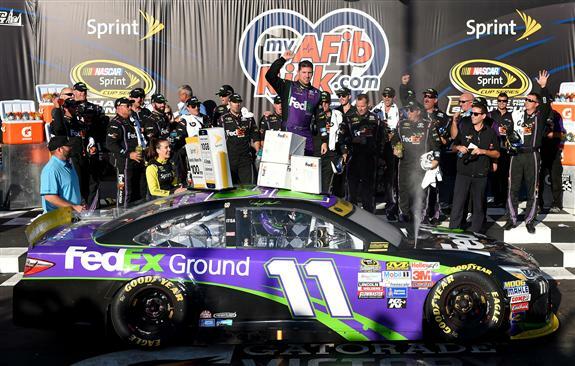 A wicked pit stop, and a spectacular restart, gave Hamlin the lead late in the going, and put him in victory lane for just the second time this season. However, this one meant that the Chase Grid already has one less spot in the next round. Three spots are the most that can be a guaranteed lock for the Contender Round, and now Hamlin has taken one of those away. To do so while injured is an incredible feat, and set the tone for the Chase. As it stands, if one is to win the championship, it will mean having to defeat Joe Gibbs Racing. The team finished first, second, fifth and ninth. All four Gibbs Toyotas made the Chase, all four finished in the top-10, including three in the top-five. At this rate, for the first time in history, a foreign manufacturer could take home the championship. CAUTIONS: 6 for 28 laps. Laps: 3-6 (#11, 47 accident-turn 3 and 4); 124-128 (Debris on backstretch); 131-134 (#3 accident-turn 2); 139-144 (#4 accident-turn 3); 192-196 (Debris-turn 4); 259-262 (Debris-turns 1 and 2). Busch 245-261; J. Gordon 262; D. Hamlin 263-267. TIME OF RACE: 2 Hrs, 51 Mins, 30 Secs. Central PA Outdoor & Sports Show Open Today until 3 p.m.